Let’s get one thing out of the way off the top, and that’s the menu. 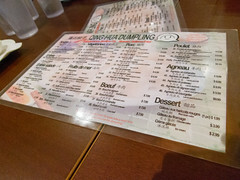 Basically, “Soup Dumplings” is the menu at Qing Hua, serving up literally dozens of different varieties of the dumplings. “Soup Dumplings” can mean a lot of things, but here it means the Shanghai style: tender little pockets of thin dumpling dough steamed up with an interior of meat, veggies, and soup broth. The result is a bit different than authentic Xiaolongbao, but the result is a nice little pocket of dumpling and broth that are quite delicious, but not without a bit of dining peril. The trick is knowing how to eat them. Mostly, I’ve learned this by my own litany of errors. Popping the entire thing in your mouth usually results in burns as the bolus of broth explodes. Leaving them too long subjects them to dough failure and leakage, so letting them cool a while is also out of the question. Daintily nibbling at them? Nope, expect to have your chin and shirt dribbling with hot soup filling. The trick is the sip: you carefully nick a corner, drink out most of the broth, and then nibble away at the rest of it, enjoying the pocket of meat and vegetables inside with the remaining, controllable bit of broth. They do a rather good job here. First, the variety: they’ve got dozens of types, with pork and coriander, pork and cabbage, and shrimp and pork being my favorites (notice a pattern?). Second, the sheer bounty of the food. 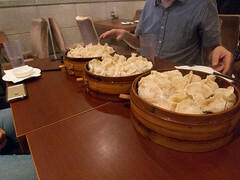 There were six of us dining, and we were wondering if 3 orders of dumplings were enough. Considering each steamer basket was overflowing with about 16 dumplings per basket, well, we had plenty of food for a “snack”. And finally, the price: Average $9 per order, these worked out to a little over $0.50CDN each. 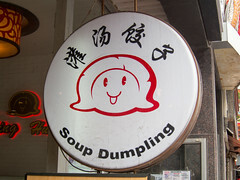 A deal, especially for the quality of dumpling. Yeah, it’s a bit of a mess to eat. The service is a bit perfunctory. But the dumplings are delicious and cheap. It’s definitely worth checking this place out if you are around Montreal on a weekday. As a frequent volunteer for FIRST Robotics, I often find myself having to spend the occasional weekend as a guest judge staying in towns that I’m normally close enough to that I’d just visit them during the day, but due to the early hour that Robotics kicks off, it’s nice staying close by. This also gives me an opportunity to check out some of the local towns in a bit more culinary detail. This year, I was spending a lot of time in Windham, so I ended up getting a room in Nashua. I’ve enjoyed a few places around Nashua before, like Martha’s Exchange or Vietnam Noodle House, but this time, I was craving a gyro. Many other places I’ve lived, gyro joints were a dime a dozen, but in New Hampshire for some reason, they are somewhat rare (although Manchester has a few, like the very good Gyro Spot). But I had noticed that since my last visit, Nashua had added Main St Gyro, so I had to give it a try.